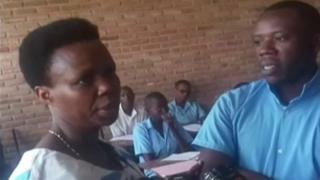 A head teacher in Burundi has been arrested for trying to disguise himself as a student and sit a national exam on another person’s behalf. “Everything you’re saying is a lie, so we’re taking you away,” said Burundi’s Education Minister Janvière Ndirahisha, who arrived at the scene in the capital, Bujumbura, with uniformed officers. “We’re going to investigate because from what we hear it’s not the first time [you’ve done this],” she told Mr Manirambona.